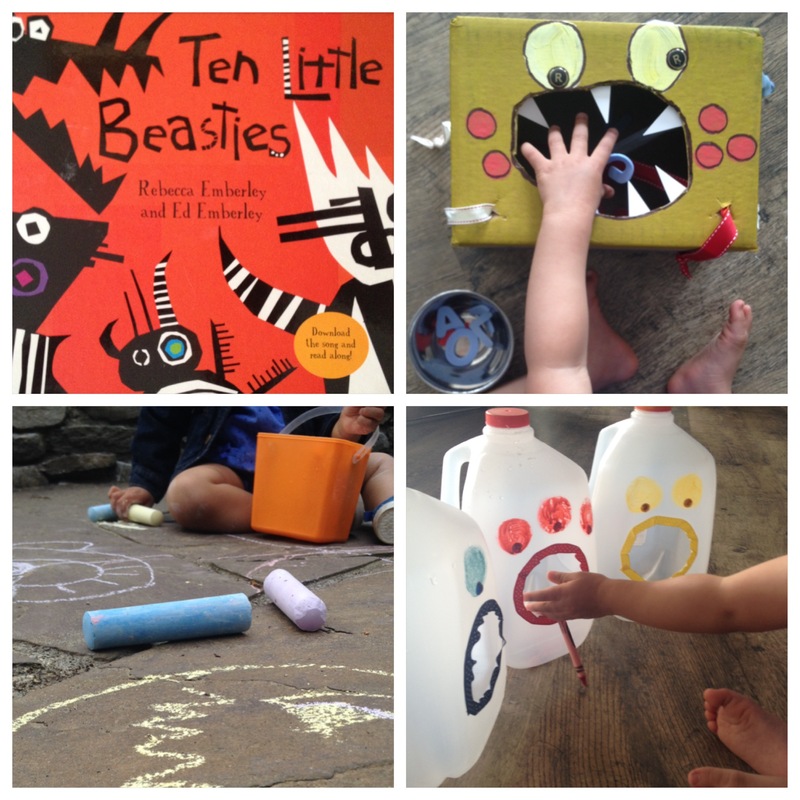 Ten Little Beasties by Rebecca Emberley: Ten little beasties is another great book by Rebecca Emberley that has awesome, colourful pictures. This book is definitely an easy read and encourages counting backwards and forwards. 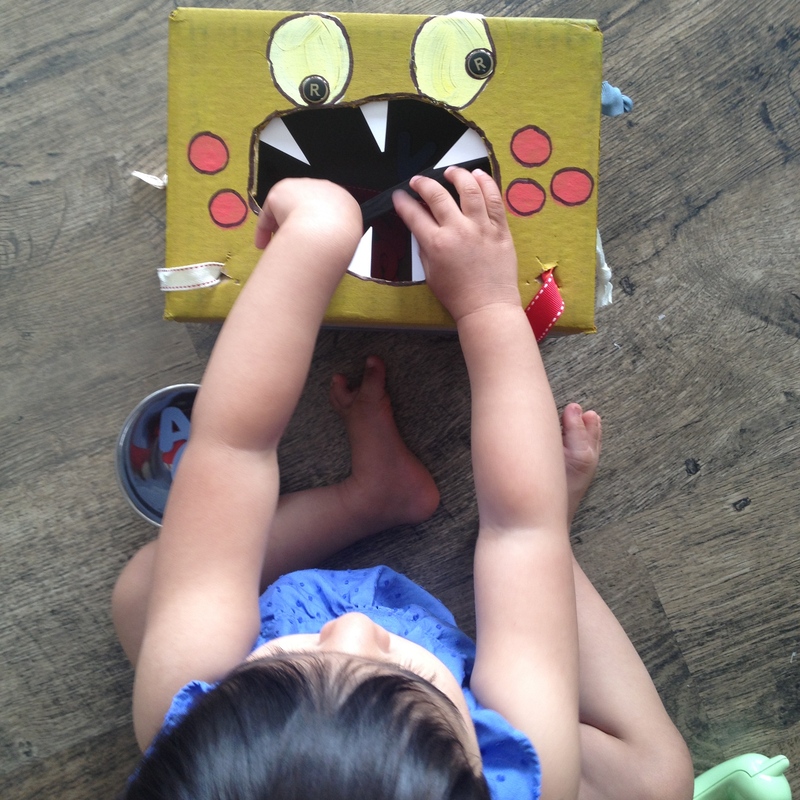 R fed her cardboard box monster some alphabet letters. As she put letters inside, I sang the alphabet song aloud. She joined in with some mumblings. The box was made simply by cutting a hole in the top for a mouth, painting it and adding embellishments. I also attached ribbons through the box for R to pull on. She enjoyed tugging one side of a ribbon and watching the other side shorten and then pulling on the shortened side to pull the ribbon back out. I knotted both ends of the ribbons so that they couldn’t be pulled all the way out of the box. a. Have the child name the letter as s/he feeds it to the monster. b. Ask the child to tell you the sound the letter makes as s/he feeds it to the monster. 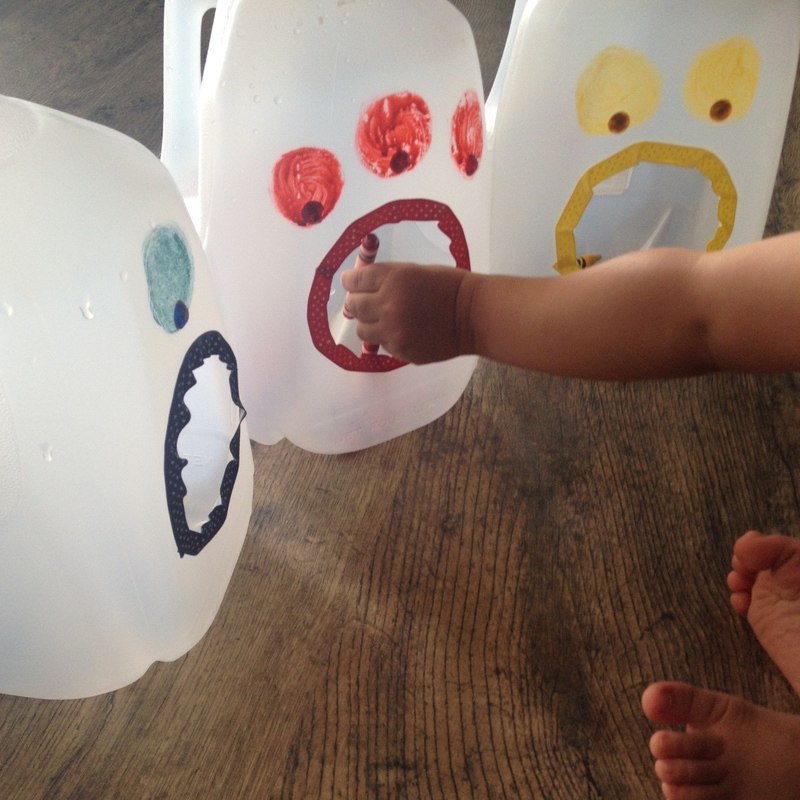 I made a red, blue and yellow monster out of milk jugs and helped R sort crayons of the appropriate colours by “feeding” the monsters. I cut out the holes using a box cutter (works also with a kitchen knife) and added tape and ribbon around the hole since the cut out parts can be sharp. We used this activity to continue to work one recognizing and naming red, blue and yellow objects; however, our colour activities are still guided by me. a. Do a colour hunt around the house for objects that are red, blue and yellow and have the child feed the correct objects to the correct monster. b. Practice writing skills by having the child create a list of contents naming all the objects fed to each monster. For pre-writers, have them draw the items. For early writers, have them add the beginning letter of each object they drew a picture of. For example, if the blue monster was fed a blue ball, have the child either add the word ball, draw a picture of a ball or draw a picture and the letter “b” next to the drawing. 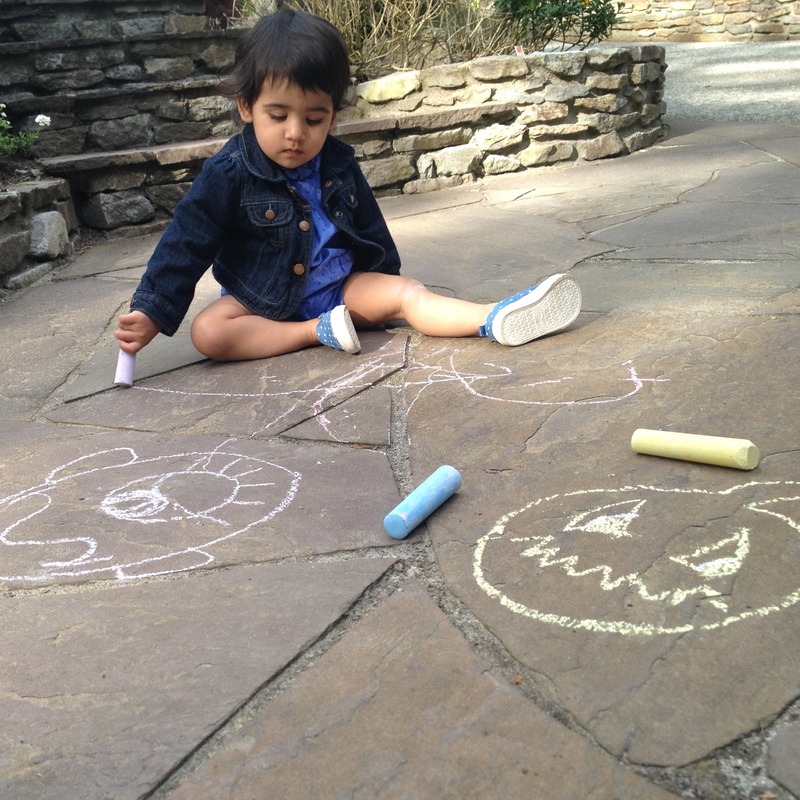 My husband and I made some chalk monsters on our stone walk way (we live on a somewhat busy street, so we didn’t want to have R drawing on the side walk) and R made some chalk strokes! This activity is a great way to develop fine motor skills and grip strength which will come in handy when she is ready to write. Documenting what she is able to do through photographs will be a wonderful to see her progression. I love the idea of feeding the colour monsters! We seem to be on a Ed Emberly kick right now. I may have to do that this weekend. I think he’d get a kick out of it!